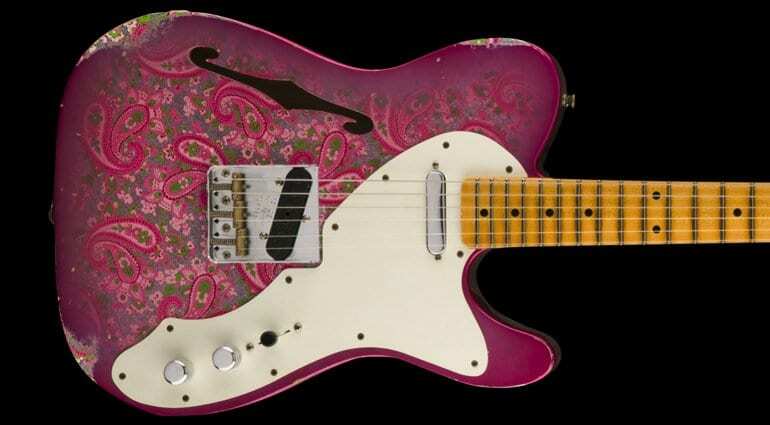 Thinline Telecasters didn’t really start until the ’60s and they would never have been Paisley. However, I think these blue and pink finishes look pretty fine – I would happily own that pink one! 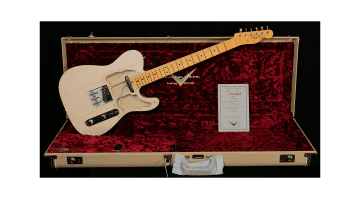 This Custom Shop 50’s Tele Thinline Relic features a quartersawn maple neck with ’57-style “Soft V” shaped profile, 9.5” radius fingerboard, modern Tele wiring with Fender’s Greasebucket tone circuit and vintage correct Tele bridge with brass saddles. 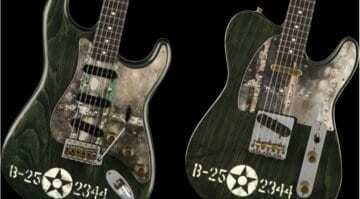 The pickups are hand-wound Custom Shop Original Blackguard on the bridge bridge and Texas Special on the neck. 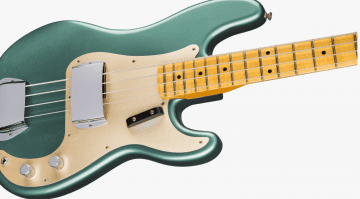 The pickguard is ‘parchment’, and the vintage-style tuners have the classic Fender logo. Expected price somewhere around GBP 3400 in the UK. Here’s another pair of Telecasters, although this time each one is outfitted with a Bigsby B-5 trem system on a two-piece, off-centre ash body with lacquer finish. The lacquer-finished rift-swan maple neck has a 10/56 “V” shaped profile, 9.5” radius fingerboard, jumbo frets. The one-ply pickguard also has the “parchment” look. These come loaded with hand-wound Twisted Tele pickups for a high-output Telecaster guitar tone, while the Greasebucket tone control allows you to roll off the highs without losing volume. We’re expecting a price of somewhere around GBP 3200 each. 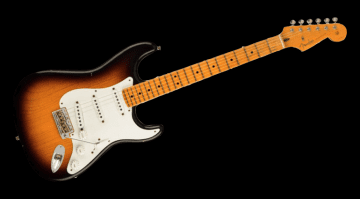 Last but not least: a sublime-looking Stratocaster with a roasted maple neck and roasted alder body with Journeyman Relic lacquer finish, matched to hand-wound Fat 60s Strat pickups with Fat 50s wiring. This mixes two eras, with the electronics making for a bolder tone whilst reducing treble loss. The AA birdseye maple neck has a “10/56 ‘V’” shaped profile, 9.5” radius fingerboard loaded with 21 6100 jumbo frets, gold 8-hole pickguard and American Vintage six-point synchronised tremolo. Again, expect to have to cough up GBP 3400 for one of these when they are released in the UK. Any of these float your boat? Let us know in the comments below.